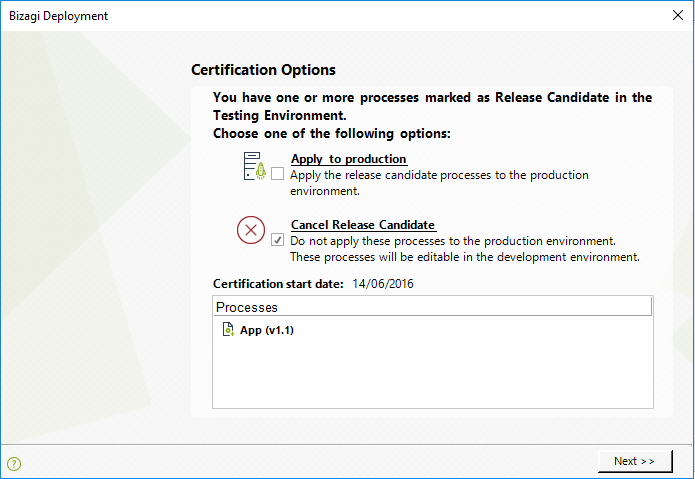 Deployment to the Test environment presents an option to mark your process versions as Release Candidates. Using this option flags these Processes as Release Candidate for the Production environment, and Bizagi gives special treatment to them in the Development environment. 2. Detecting the need for adjustments and fine tuning. 3. Running a demo (presentation purposes). 1. Locks them in the Development environment to avoid further edits. In other words, the workflow, and other objects such as attributes and forms used by those process versions will not be allowed to make changes until the given Release Candidate cycle has finished). 2. Keeps the Release Candidate Processes "on hold", with all the necessary information of their related objects to be deployed to Production. if you need to make any adjustments in these process, canceling the Release Candidate status is required. Update the Process version, restart the Test deployment with the Release Candidate status selected, and repeat as necessary until the Processes are certified. How does Release Candidate status work? Process versions marked as Release Candidate have their objects locked in the Development environment as detailed at Continuous improvement and development after a deployment. Once the deployment to the Test environment is completed with the process versions marked as Release Candidate, users involved in the Test environment should carry out their tests to verify that those process versions can be deployed to the Production environment. Within the user acceptance tests, any flaws detected in the Processes version or any additional requirements asked for them, will need to be addressed in the Development environment. To carry out modifications it will be necessary to use Bizagi Studio's Deploy Process option and to cancel the current Release Candidate. Once the Realese Candidate is canceled, you can make necessary modifications in the Development environment. 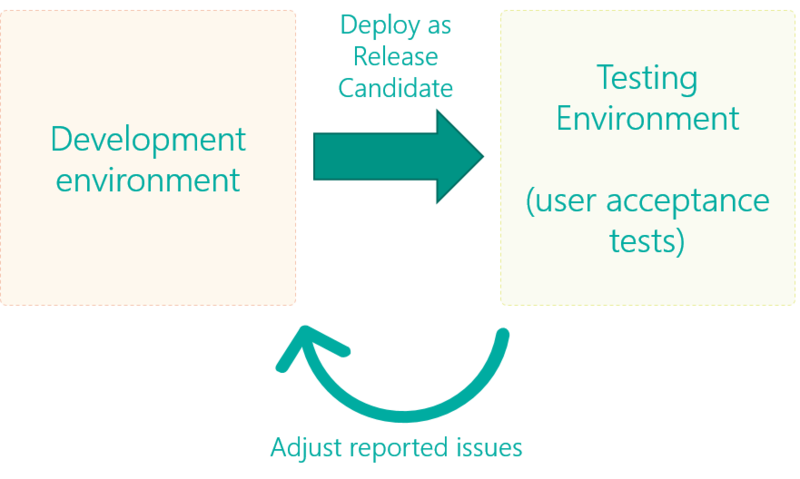 You can then start a new deployment to the Test environment of the revised Release Candidate. This procedure should be repeated until the user acceptance tests are completed and no further modifications or adjustments are required for these process versions. Returning to Bizagi Studio's deployment option, you can choose to apply the current Release Candidate to the Production environment. Doing this, launches a deployment to the Production environment with those process versions already approved and certified. Summarizing this concept, when there is a current Release Candidate in the Test environment, the Deploy Process option of the Process Wizard's step 7 (Execute) will prompt you to either: Apply the Release Candidate (that is, to deploy those Process versions to Production) or to Cancel it (so you can make changes in the Development environment for those Processes, followed by a new deployment to Test).